Every single day people are striving hard to achieve financial freedom but very few can really achieve it. But thanks to modern technology which has created a scope for the every single individual in the world to make money by trading the forex market. Previously trading the financial assets was only limited to the large banks and institution. But now a day’s people like us have the liberty to trade the forex market with a very small amount of trading capital. Most of the reputed brokers are now offering a high-leverage trading account to their clients which even allows them to trade the forex market with 100 dollars deposit. But if you know the perfect method of trading the financial instrument then you can easily turn your small trading account into a big one and most importantly you will never have to worry about your financial security in the near future. But in order to make a decent earning from the forex market you need to learn the perfect method of setting up your charts and other tools in your mt4 trading platform. Let’s discuss some of the key facts which we need to follow in order to ensure your financial stability. 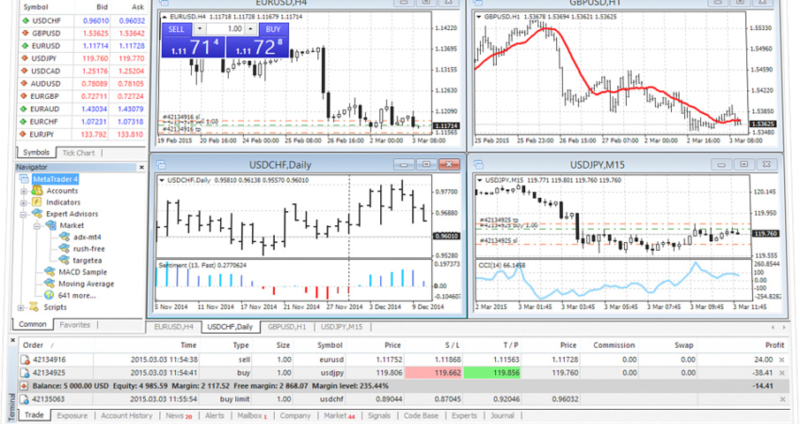 Opening multiple charts for a certain asset: Trading the financial instrument can be extremely confusing if you don’t have the proper knowledge to execute your trades in the market. If you truly want to become a professional trader then you need to do the multiple time frame analysis in the market. Once you login to your trading account in your mt4 platform you will see a chart with a name of certain financial assets in the market. So let’s say that we are going to take a trade in the EUSDUSD pair. So we will open a three chart of the EURUSD pair by right clicking on the EURUSD under the market watch tab. If you are relatively new to this platform then you will see the pair on the left side of your trading platform. Once you find your trading assets in the market make sure you open three individual charts for the same assets. Once it’s done you need to change the first chart time frame into 4 hours, the second one into daily and use the weekly time frame in the last chart. Once it’s done make sure that you don’t have any indicators and EAs installed rather focus in the raw price data. Multiple time frame analysis: This is the most crucial things for the traders while using the different time frame to trade a single asset. Many new traders often make it too complex but we will make it as simple as possible. If you have a very simple foundation in the forex market then you should probably know that trend is the best friend in the market. We will simply use this principle in the market. As a retail trader in the forex market before we take any trade in the market, we will make sure that all the three-time frame charts are 4 hours, daily and the weekly chart is exhibiting the same trend in the market. If we get a same signal in all three different charts then we will focus on our trade setup in favor of the prevailing trend of the market. Most of the novice traders in involved in forex trading doesn’t pay enough importance to their multiple time frame analysis and thus incur heavy losses in the market. But if you look at the professional traders’ platform then you will see that they have organized different time frame of certain assets in the market so that they can execute the best possible trades in the market. Using the pending feature: Most of the retail traders in the forex market execute their trade manually when they spot any trading setup. But if you look at the professional traders’ execution system then you will be surprised to see that most of them use the pending entry options in the market to execute their orders. So why do they use the pending orders in the market instead of market execution? The answer is pretty simple. They want to make sure that they take the best trades in the market within the shortest possible logical stop loss. If you take any trade after the price action confirmation signal then you will see that even though you trade hits your potential take profit level but most of the time it retraces a little bit against you. So as a professional trader you can always use the minor support and resistance level in the market to set your pending orders to minimize the potential loss of a single trade in the market. But before you start trading the retracement in the market always make sure that you spot your trading signal in the market in the higher time frame. Summary: In the world of global economic crisis it’s extremely hard to secure our financial stability. But some of the smart people have already trying their hard to secure their financial freedom by trading the forex market but sadly they are failing again and again. The reason behind their failure lies behind the improper use their mt4 platform and its features. So if you truly want to become profitable traders in the forex market make sure that you have a clean trading chart and you know how to do the multiple time frame analysis in your mt4 platform. And always try to minimize your potential risk exposure by using the retracement trading technique. What is an introducing broker?